Thinking it may be time to install a new air conditioner in your Scranton/Wilkes-Barre area home? In Northeastern PA, the summers can get hot and humid—meaning you need an AC to keep your home cool and comfortable. If your home’s air conditioner is on its last leg and you are looking to replace it, count on T.E. Spall & Son. 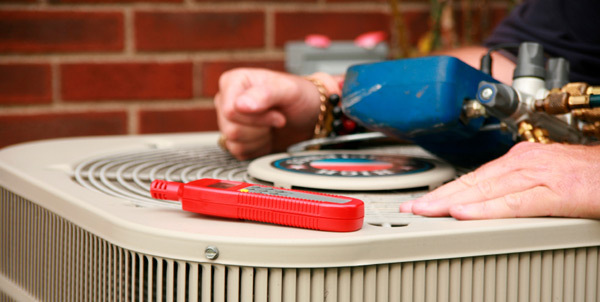 Our HVAC company ensures that you have an efficient AC unit that will keep your home cool all summer long. When you have a new air conditioner installed by T.E. Spall & Son, one of our trained and certified AC installation professionals will assess your home’s unique cooling needs and recommend a range of systems that will effectively and efficiently cool your home during hot Northeast PA summers. We will not only evaluate your home’s HVAC system, but also take into consideration your personal comfort preferences, your budget, and even issues like allergies to help you pick the best air conditioner for your home and your needs. Worried About Central Air Conditioner Installation Cost? We Have Financing Available! Worried about how much a central air conditioning installation costs? We offer a variety of options for financing any of our HVAC services, products or systems. Our financing options allow you to invest in a home comfort system without breaking your bank account. We don’t think you should go without quality cooling, and don’t think you should have worry about the cost of a new air conditioner. The comfort of you and your family is important! With 30 years of experience providing HVAC services in Northeastern PA, we understand the cooling needs of homes in this area as well as anyone. We’ve provided air conditioning services to thousands of northeastern Pennsylvania residents, many of whom are satisfied repeat customers. Call us today at (877) 591-7508 to find out why Scranton/Wilkes-Barre area families have trusted T.E. Spall & Son with their air conditioning needs since 1985! Lower Energy Bills – Air conditioners installed today are significantly more energy efficient than air conditioners installed more than 10 years ago. Even today’s least efficient air conditioning systems are more energy efficient than some of the most energy-efficient systems installed 10 or more years ago. Installing a new energy-efficient air conditioning system can save you hundreds of dollars on your annual cooling bills—and may even qualify for tax credits! Higher Resale Value – Energy efficient air conditioners are highly sought after among homebuyers today. With AC units accounting for a significant portion of your summer energy bills, an energy efficient cooling system can add thousands of dollars to the resale value of your home. When you choose T.E. Spall & Son for your air conditioner installation, our technicians will give your household a thorough assessment to properly size your home and recommend the ideal systems available.